As a child my mother called me a ‘good-eater’, because every meal ended with a spotlessly clean plate. Growing up I even had a reputation for being able to out-feast my uncles during our family Christmas Day feast. They would sit back in admiration as I’d be the one going back for second and third helpings of Christmas classics. Like crispy Yorkshire Puddings, sage stuffing, roasted parsnips and hearty gravy. Over the years I’ve tried to replicate those Christmas classics, not always with great success. My Yorkshire Pudding experiment produced something more like ‘Yorkshire muffins’ and my home-made stuffing didn’t taste quite like the ‘Paxo’ mix of the old days. 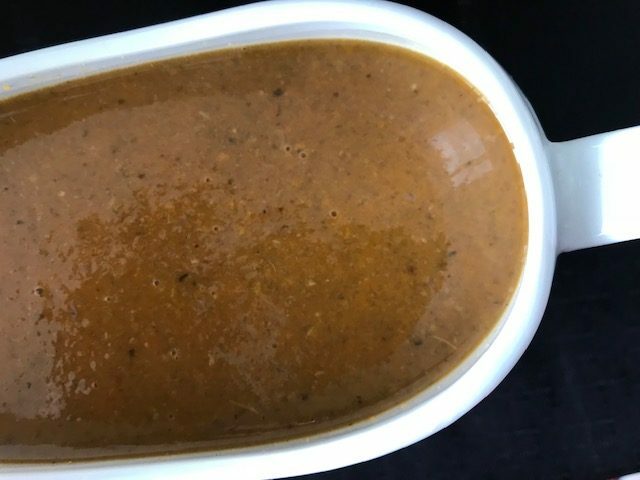 But, last year’s Christmas Day vegan gravy experiment worked a treat – possibly because I followed a recipe by Jamie Oliver. I put the success of Jamie Oliver’s recipe down to the ‘umami’ factor. Umami, also known as the fifth flavour (after salty, sweet, sour and bitter) is often described as a meaty flavour. No surprise then that adding a umami hit is gathering pace as a way to enhance the flavour of vegan and vegetarian dishes. The umami factor in this recipe comes from two crucial ingredients – Marmite (or Vegemite for Australians) and porcini mushrooms. For me at least you can never go wrong with a Jamie Oliver recipe. Something I need to remember the next time I try my hand at Yorkshire Puddings. 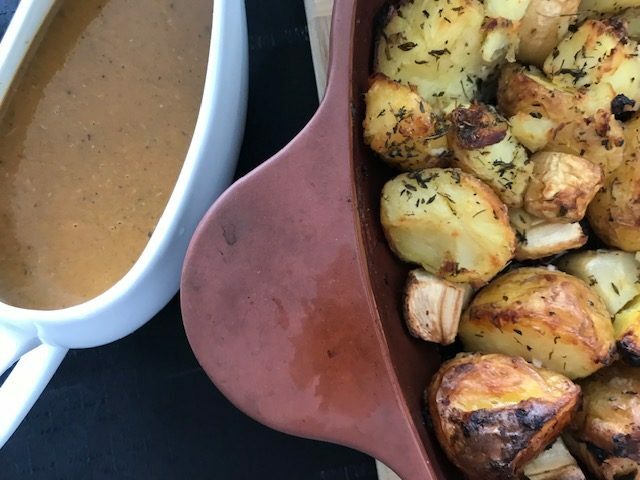 Jamie Oliver’s Vegan Gravy recipe is a winning addition to a vegetarian or vegan Christmas or Thanksgiving feast. Putting the umami essentials aside (don’t skip the porcini and Vegemite/Marmite) I’d say there’s a little flexibility with the other ingredients. I used wine in place of the port (you could also try beer) and added a few berries in place of the blackcurrant jam…. All this talk of Christmas Day feasts is making me hungry. 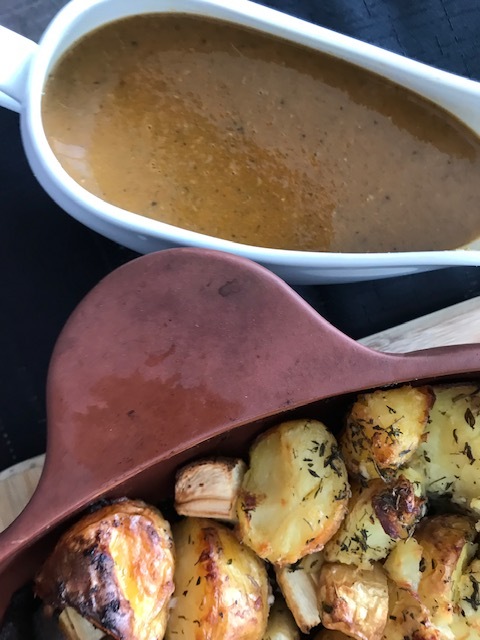 Last year I served this delicious gravy with a Vegetarian Mushroom Loaf and plenty of roast potatoes and veggies. This year I’m looking for another hero vegetarian feasty dish – please send any suggestions this way! Tags: gravy, Jamie Oliver, umami, vegan, vegetarian. Bookmark the permalink. The gravy looks rich and flavorful Laura. I like the earthy, deep taste of mushrooms too. I have not used marmite. Will have to try. Thanks for sharing! The story about you being a good eater is so cute! Thanks Sandhya – glad you like the recipe, although all of the credit goes to Jamie Oliver! Thank you Laura, I’ll have to check this out as I’ve been looking for a meat-free gravy for making our Canadian classic, poutine. Try this recipe Annika – I’m sure you won’t be disappointed! That gravy would be wonderful with the crispy potatoes, yum. Thanks Liz, I couldn’t agree more! Fantastic idea Chloe – I have miso at home too so will have to try that next time!